I know the picture isn’t great. I’ll try to put some better ones on later. I always end up getting to excited about refurbishing or using tools and end up forgetting to take before pictures. 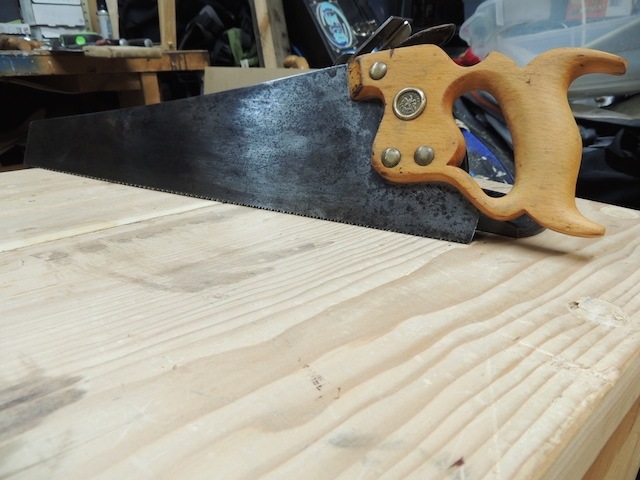 I got this saw home and had it taken apart to start cleaning and refinishing the handle before remembering to snap some pictures. 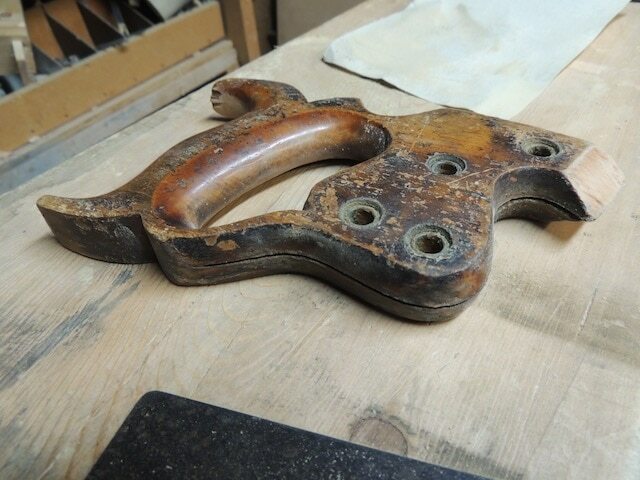 This is the first saw handle that I am refinishing. I am figuring on using linseed oil and wood wax. Is there anything in particular I should pay attention to or know as I tackle this? Or is the project as straight forward as I think. I already cleaned up the blade using 2000 grit wet/dry sandpaper. I started cleaning up the handle using 220 grit sandpaper. I am trying just to sand down to the lighter/unstained wood grain. I am not planing to sand out any deep scratches or chips just mainly want to clean it up. 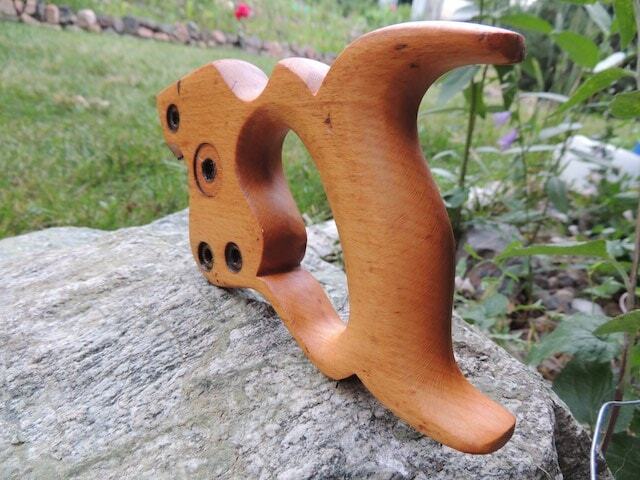 Are all saws marked “Warranted Superior” Fulton brand? 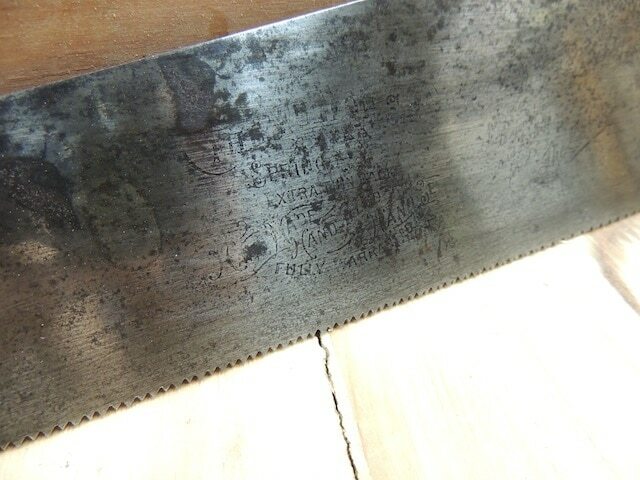 I have several large saws with this marking, but no other. So in the research I did it looked like Warranted Superior is a kind of sub-brand Disston. Fulton saw was apparently a Sears saw. 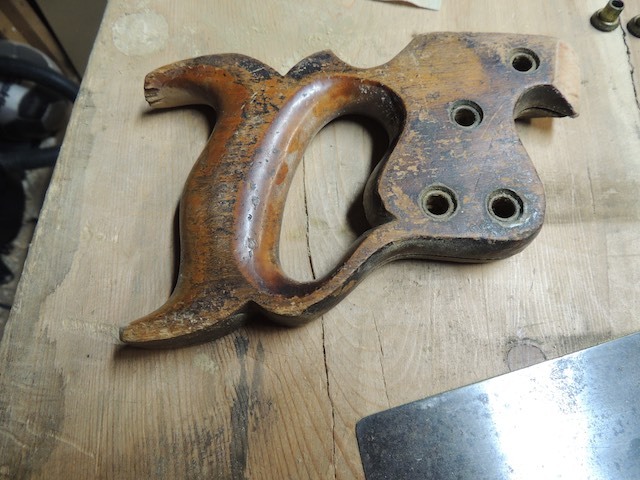 So it seems Warranted Superior saws were either Disston saw sold as department store saws or else were a brand that Disston purchase and adapted to their brand but didn’t want to give the premium Disston name. It also seems that if you got a replacement medallion for a Disston saw it was a Warranted Superior medallion. Or at least that seems to be what I found or my understanding. Here is a link to Disston Institutes explanation to. To clean up saws generally first I try to remember to take pictures (because to often I just get excited and dive in and then never have before pictures). Then I take the saw apart, essentially just remove the handle. Once I have the saw disassembled I normally start with cleaning up the blade. I use wet/dry sandpaper to clean the blade. If there is a lot of rust on the blade I will use 400 grit but generally I try to primarily use 2000. 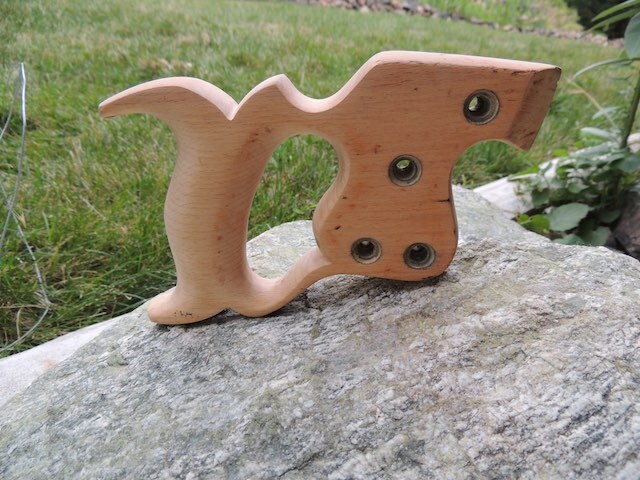 I also use a block of wood to sand with. If you only use fingers or something spongy to sand with that it is much easier to remove or sand way any etching or stamp on the saw blade. The hard wooden block makes sure that the sandpaper stays above the etching, unless the etching is already pretty much just worn off. While sanding I also try to keep way from the 1/8″ by the teeth to help make sure I don’t sand down any kerf that is already present on the saw. 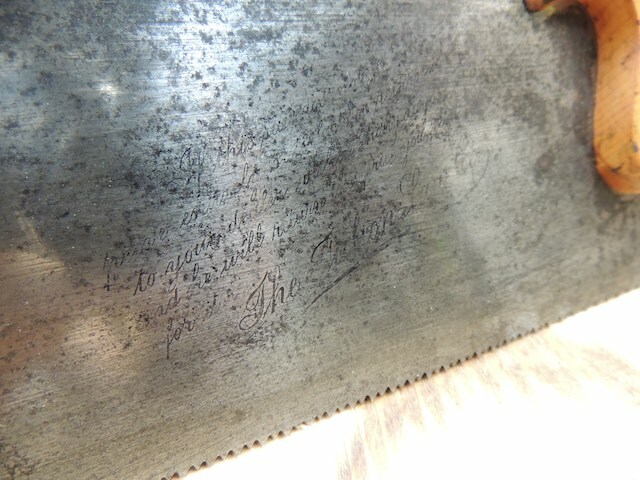 Some people also put gun-bluing on the blade to help show the etching and to give it strength and protection. I have not tried this yet. Next I like to sand down the handles. I know that some people just prefer to clean the handle or try to find ways to clean the handle without removing the original (or current). So far I have really enjoyed sanding the current finish off the handles to apply a linseed oil or some other type of rub-in oil. 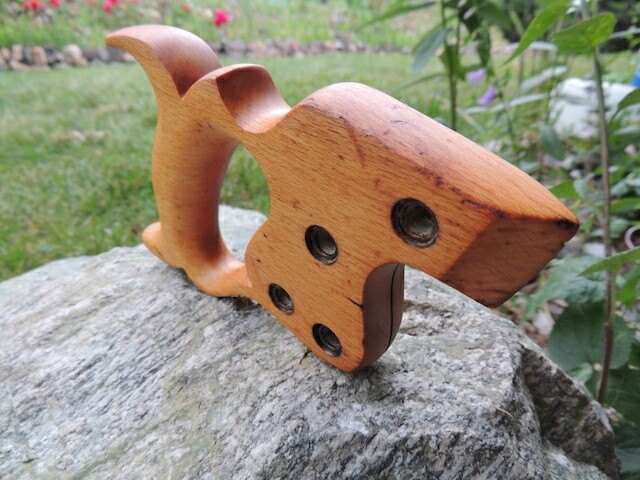 I do not try to remove every stain or blemish from the handle just try to get it back down to the original wood to refinish. I think that the dents and dings of the handles give it some charm and if I just wanted the handle to look brand new it would likely be easier just to make a brand new one. Lastly, I clean up the medallions and buttons/pins some. I use a light hand wire brush just to take off any dirt. I don’t necessarily try to polish them to a shine but do try to get the dirt, grime, or other such stuff off of them. If I’m going to tune the saw myself I will do it now before putting the handle back on. 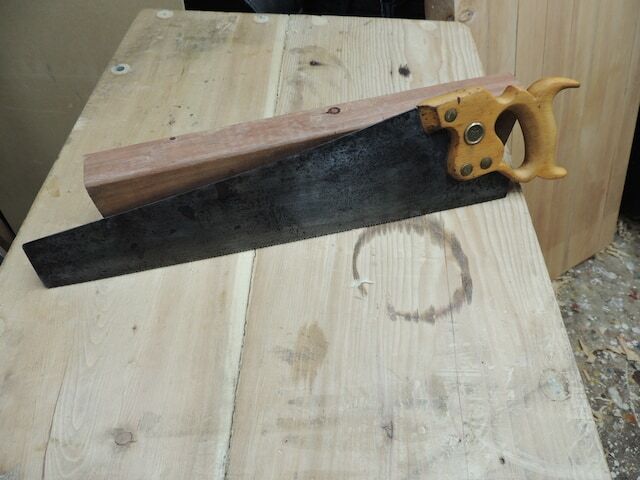 Then I put the handle back on and find some scrape to try the saw on. After the I try to remember to take the after pictures. Let me know if you are wanting any more information or clarification on a step. 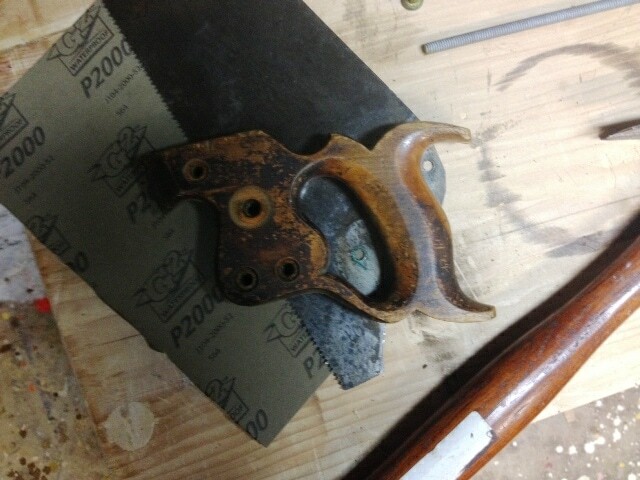 That’s how I refurbish my saws. Thank you, Seth! I appreciate your advise. Thats sounds like a thorough plan for getting the job done. 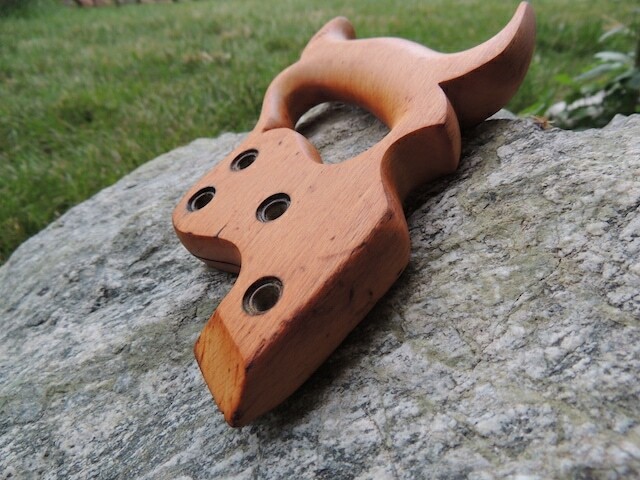 Here’s what I was able to do to the handle. I’ll try to get some pictures of the saw all back together later. Here is the saw all put together and cleaned up. 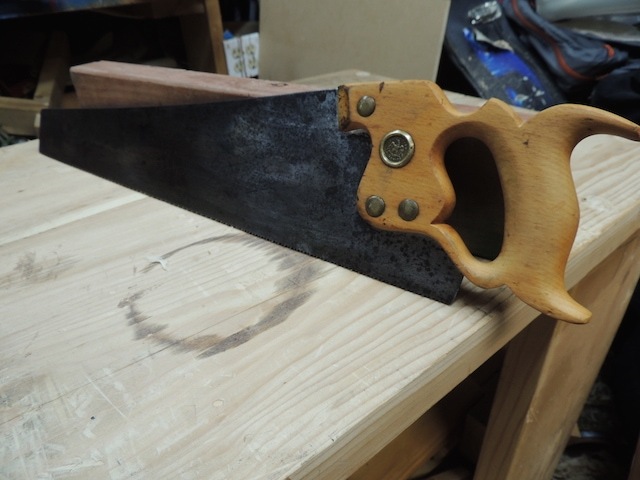 The one thing refurbishing old hand saws I inevitably end up doing is taking a rasp to the handle and shaping it so it fits my hand. 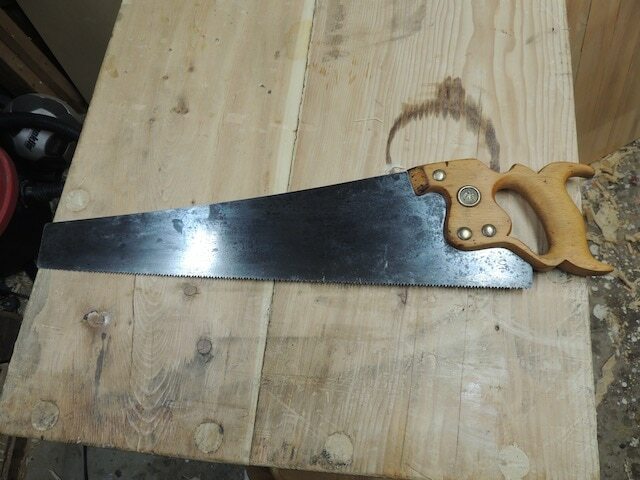 When I first started out I bought a couple of rather nice large Spear and Jackson rip saws. Not particularly old (from the 50’s I think) but nice. Once all cleaned up, sharpened and set they looked lovely but were a complete nightmare to use. The handle dug into the heel of my palm and after about half an hours use my hand felt bruised and it puts you off using them. The difference once it fits your hand is quite astonishing. Don’t believe me? 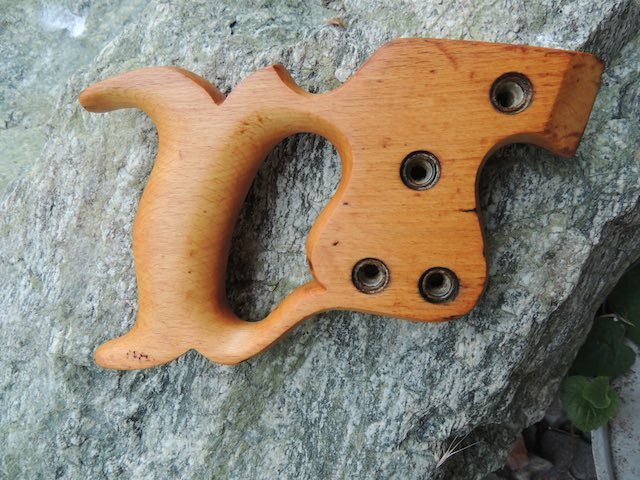 Buy an old scrap saw from a flea market/ car boot sale and have a bash at the handle. Once you have a comfortable shape carefully round over the edges and you wont be able to tell its been altered. Just because some dusty designer a very long time ago thought the handle looked nice with a full set of french curves built in doesn’t mean he had to use it for a week sawing green oak! Don’t be afraid to alter the handles. You either buy a saw to hang on a pub wall covered in varnish or you buy it to use……..so make it comfortable to use….and use it! 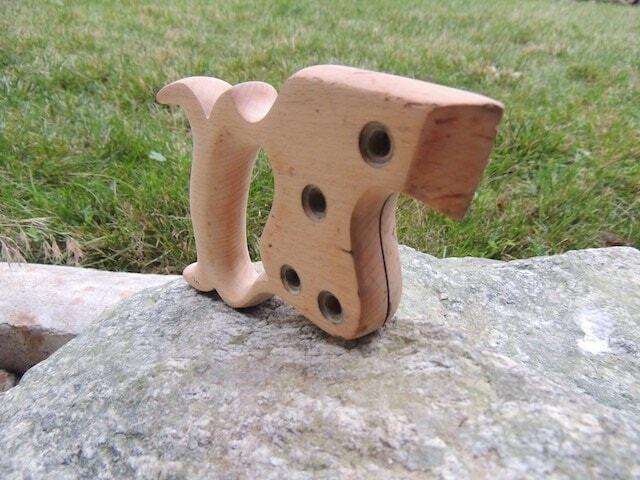 ~Oh yes, forgot to add, if you do buy a scrap saw for a few pennies and play at shaping the handle, once you have finished you can take a hacksaw to the old saw plate and get a couple of free card/cabinet scrapers!